We wanted to provide a few brief but imporant updates to our supporters as we head into the final stretch toward July 4th. Although the American Pyrotechnics Safety & Education Foundation is still in its infancy, the Executive Committee felt it important to provide industry supporters with a resource this season to assist them in educating youth and their families about the safe use of consumer fireworks. 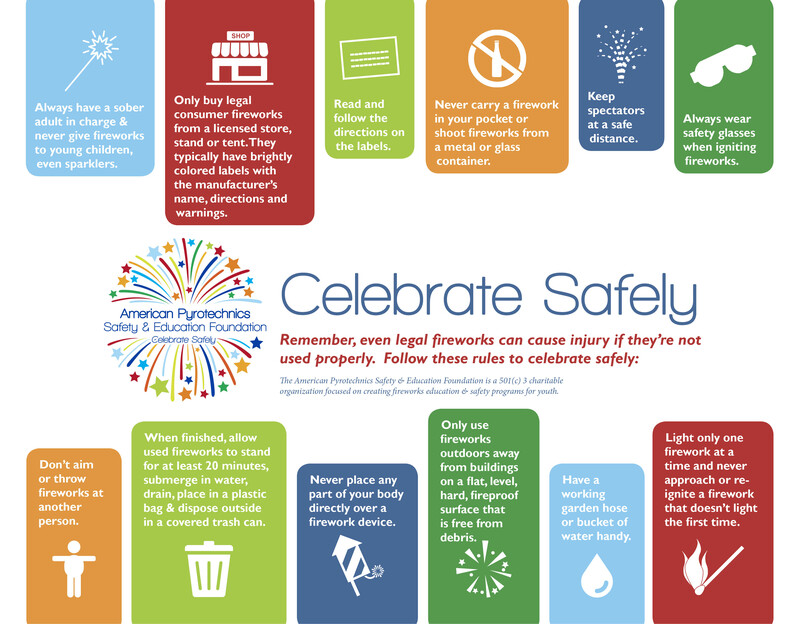 A vibrant flyer and poster have been designed incorporating the fireworks safety rules outlined in the school curricula developed by former CPSC Chair Inez Tenenbaum of the Nelson Mullins law firm. Attached to this email are templates for both a 8 1/2 " x 11" flyer and a 24" x 36" poster sized listing of rules to educate young people on how to use fireworks safely. These resources are designed to be professionally printed (with bleeds) and we encourage industry members to make them available to customers or hang them in their retail outlets. Recently, a young high school teacher from Santa Rita High School in Tucson, AZ contacted the Foundation about a project she developed for her senior math finance class. The idea was to meld traditional finance concepts like supply & demand and cost-benefit analysis with the students' love of fireworks and desire for a graduation fireworks show. Students wrote proposals, pitched the idea to school district officials, worked on deadlines, and raised the funds to end their school year with a bang -- literally. The project was a tremendous success and culminated in a fireworks show on May 21 put on by APA member Fireworks Productions of Arizona. According to their teacher, Melissa O'Neill, "the magic behind the fireworks took the students' learning outside the classroom...they became confident & leaders in their own way, something that we can never take away." Read more about this exciting education initative here. Curricula for grades 4-8 and 9-12 have been drafted and are undergoing review. Once they are finalized, the Foundation will look for a national partner to help in the development of deliverables including lesson plans, tutorials, videos, etc. Learn about fireworks science, history & safety by "liking" the recently established Foundation Facebook page.